The moment to declare independence – Freedom for Catalonia! “We have suggested to the Catalan president that if Spain intervenes in our competences, we should found a united national alliance and declare independence”. The general secretary of Solidaritat Catalana per la Independència (Catalan national party for independence) declared in the parliament last 16th July, providing reply to the statements of the President de la Generalitat Mr Artur Mas, who suggested advancing elections in Catalonia as one of the possibilities to handle the threats from the Spanish state of intervening the Catalan government. 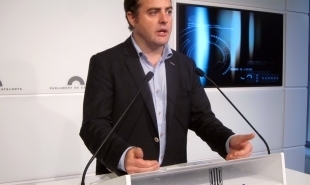 Mr Bertran, as a parliament representative, claimed that “one must not hide in the difficult moments, we must be all in the battle front” and added that the proposal of the president is “a proof of weakness in front of Spain, showing an attitude of failure and indecision that our country cannot afford”. Uriel Bertran believes that advancing the elections in Catalonia is a proof of the weakness of our government towards the Spanish state. Further on, Uriel Bertran has announced that “in the case Spain would threaten to intervene our government, we suggest the president to found a united national alliance and declare independence”. This is the only scenario that the independent party supports in order to help the current government and to “immediately start negotiations with the international community to obtain recognition of a Catalan constitution within the frame of the European Union”. Mr Bertan believes that the moment to has come to motivate the country and give our nation hope for a better future; he reminded president Artur Mas that the people of Catalonia expect our government to do a step forward for independence, in the case of intervention by the Spanish authorities. “The case of Catalonia might also rebound directly against a Scottish secession attempt. It is unclear whether a country that secedes from an EU member would automatically become a new member, or would have to go to the back of the line to apply for membership. Right now we are in a level that I consider less important be an EU member than remain into Spain. Considering that our main problem is the Spanish abuse who leads us to the total bankruptcy. Catalans and Spaniards are now into EU and for Catalans it is an authentic disaster. Maybe out of Spain and of EU the business could be better. Althought I prefer being into the EU as a Catalan state.